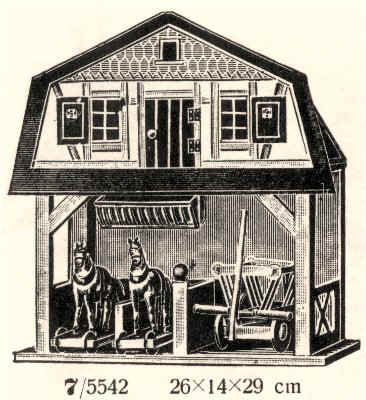 The Moritz Gottschalk company produced a lot more than dollhouses; it could be said that they produced every kind of toy structure imaginable, from warehouses, forts, theaters and shops to stables, rooms, and kitchens. Surprisingly, none of the structures are marked with the company’s name. But many clues helped T/m easily identify this Gottschalk stable: a red or blue roof, lithographed paper details, and the creative use and replication of architectural forms in the toy structure. Just as race tracks and garages filled with four-wheeled vehicles occupy hours of play today, the Red Roof Stable Model No. 4541 was a favorite of boys and girls. Models ranged in size and accessories brought to life all sorts of imaginative play with farm animals and hay carts to haul bailed hay or horses to pull carriages on cobblestone roads. We think it is really neat to see the similarities between this stable and the stables that children can play with today! Like a broken (polka) record, we seem to talk a lot about the German toy industry here on Small Talk. Just goes to show how prolific it used to be! One of the industry’s most important producers in the late 19th and early 20th centuries was Moritz Gottschalk company. Gottschalk is best known for its beautifully designed dollhouses, which mirrored the architectural styles of the day. The company also sold equally beautiful toy kitchens, general stores, horse stables, forts, and more. Like other toy companies in Germany, Gottschalk wanted to reach other European markets as well as America, so they offered their toy line via catalog. The catalogs provided model numbers, dates and specifications which makes identifying these gems over a century later a breeze! The earliest line of Gottschalk toys were wooden dollhouses with blue painted roofs, chromolithographed paper facades, and Victorian architectural details. Mass production techniques made the manufacturing process faster and more efficient. Around 1910, the company switched to houses with red painted roofs and hand-painted facades. Seems a little counterintuitive, right? While no one really knows why this shift to a slower production method occurred, dollhouse historians believe the changes reflected popular taste. In the late 1800s and early 1900s, two companies dominated the dollhouse market: the R. Bliss Manufacturing Company of Pawtucket, Rhode Island, and the Moritz Gottschalk Company of Marienberg, Germany. Both companies were well known for their colorful houses, which sold at a lower price due to the decrease in production costs (thank you mass production! ), making the toys available to a wide range of social classes. This past summer, T/m hosted Antiques Roadshow and appraiser Marshall Martin to examine a Bliss dollhouse and a Gottschalk dollhouse from the museum collection. Catch it on your local PBS Station on Monday April 7 at 7pm CST or stay tuned here for a link to the segment.